Celebrations are planned all over the Northern Hemisphere for the yearly astronomical event. The first day of summer is almost here! In a matter of weeks, grocery stores are going to start stocking sunscreen closer to the checkout lines, parents are going to figure out what to do with kids who aren’t occupied with school every weekday, and the Earth is going to make its yearly hat tip to the sun. Here’s what you need to know about the 2016 summer solstice. 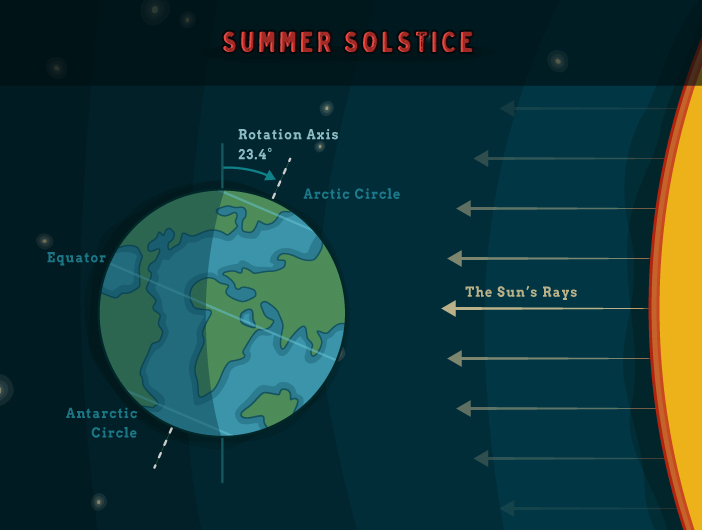 The summer solstice occours when the Earth’s North Pole tilts as much as it possibly can towards the sun. If you were standing on the North Pole, which experiences daylight for six months of the year, you would see the sun at its highest point. The winter solstice is the opposite: it’s when the Earth tilts away from the sun as much as it can during its orbit. When Is The Summer Solstice In 2016? The 2016 summer solstice will occur on June 20 at 6:34 AM Eastern Daylight Time. In the Northern Hemisphere, the summer solstice marks both the longest day of the year and the official start of the summer season. Interestingly, the summer solstice can occur on June 20, 21, or 22. June 21 is the most common date. A summer solstice on June 22 is very rare. The last one happened in 1975. The next one won’t happen until 2203. Because of its astronomical significance, cultures around the world celebrate on or around summer solstice. Here are some of the more interesting ones happening in 2016. Guru Purnima is a holiday in India and Nepal that is observed by Hindus, Jains, and Buddhists. It’s a day to show respect and appreciation to teachers. National Aboriginal Day is a Canadian holiday that recognizes the culture and contributions of the First Nations, Inuit, and Métis peoples. June 2016 will be the 20th year of the celebration. June 21 was chosen in an agreement between Indigenous organizations and the government of Canada due to summer solstice’s significance to indigenous history. Stonehenge — a mysterious stone structure built over 5,000 years ago in modern Wiltshire, England — is believed to mark the change of the seasons. Parts of the monument are perfectly aligned with the setting of the sun on the winter solstice and the rising of the sun on the summer solstice. 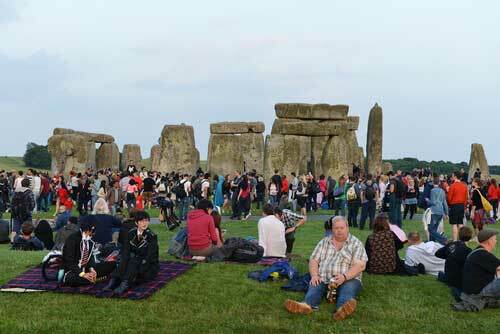 Today, people gather around the prehistoric structure to celebrate the Stonehenge Summer Solstice Festival. Visitors mark the change of seasons by camping around Stonehenge for four days, drinking beer, and eating fire-grilled food. This summer solstice party in Southern California attracts more than 100,000 celebrants every year. It includes a three day music festival, yoga, elaborate costumes, and a colorful parade. It started in 1974 when street performer Michael Gonzalez convinced his friends to march down State Street in celebration of his birthday. It slowly grew every year until it became the popular festival it is today. In Sweden, Midsommar is the second most significant holiday, after Christmas. Most of the Swedish population flocks to the countryside in order to sing, eat pickled herring, drink vodka and beer, wear flowers in their hair, and dance around a pole. According to legend, if young women pick flowers on their way home from the celebration and stuff them under their pillow, they’ll dream of their future husband. Tirgan is an ancient summer celebration celebrated in several regions of Iran. Celebrants splash water on each other, recite poetry, dance, and eat traditional Iranian dishes like spinach soup. According to legend, Tirgan began when Arash, the best archer in Iran, was chosen to draw the borders between the rival countries of Iran and Turan. He was to climb a mountain and shoot an arrow as far as he could. Its landing spot would determine the border. When he shot the arrow at dawn, it flew until noon, expanding Iran beyond all expectations. Even though July and August will probably be warmer than June, the days will start to get shorter after the summer solstice in 2016. It will probably take a few weeks before you begin to notice the difference, but you should still enjoy the brightly lit, early evenings while you still can. "The 2016 summer solstice will occur on June 20 at 6:34 AM Eastern Daylight Time"
Yes, it’s possible to give a great gift and save the planet.